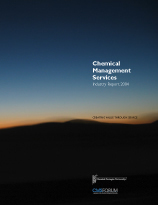 The Chemical Management Services (CMS) Industry Report 2004 provides an overview of the CMS industry's structure, conduct, and performance. This report describes an emerging trend in "servicizing" the chemical supply chain where chemical suppliers are deriving profits from selling fewer chemicals and providing more services to their customers. This is the second Industry Report published and looks at trends and performance of the CMS industry since 2000. Please fill out the form below to download a free copy of the 2004 CMS Industry Report.